The OnePlus 5 is expected to become official sooner than later as numerous rumors and leaks are hinting at a May or early June announcement by OnePlus. True, the company doesn't really have an established annual time window for new flagship releases - the OnePlus One was announced in April, the OnePlus 2 - in July, the OnePlus 3 - in June. Oh, and why 5? Simple - the number "4" is deemed unlucky in Chinese folklore as it sounds almost the same as "death" or "decease", and let's face it, no one would want that grim reminder of life's ultimate epilogue associated with their flashy new gadget. Yeah, the OnePlus 4 is most likely not happening. With that out of the equation, let's see what we know of the OnePlus 5 so far. UPDATE: And here it is! Revealed by OnePlus itself, the render - seen above - tells us that the OnePlus 5 features "dual cameras" for "clearer photos." This dual camera system seems like it might work similarly to the one at the rear of the Apple iPhone 7 Plus, though it's probably best for us to leave this comparison for when we'll have a OnePlus 5 in our hands. The lack of rear-positioned fingerprint sensor means one thing only - the home button at the front that doubles as a fingerprint scanner will still be a thing with the OnePlus 5. The capacitive buttons will probably remain a staple as well - good on OnePlus for sticking with its shtick! Alas, those two highlights we mentioned above probably mean that we won't see any radical change in the overall design of the phone, We shouldn't expect an edge-to-edge, bezel-busting display of any sort on the OnePlus 5, and that's not a bad thing — the OnePlus 3/3T was not the most radically efficient phone when it came to screen-to-body ratio, but it felt pleasingly compact in hand. One change that has been confirmed by OnePlus CEO Pete Lau himself is that the headphone jack is not going anywhere from the OnePlus 5, it's just being repositioned. UPDATE: OnePlus CEO Pete Lau has claimed that the OnePlus 5 will likely end up being the thinnest flagship smartphone once it hits the shelves. Hopefully, no compromises will be made with the battery inside. As a reminder, the OnePlus 3 and 3T measured at 7.35mm thin. In terms of display, the phone is expected to carry a 5.5-inch display, which is similar to what... almost all of OnePlus' phones so far have employed. We've heard nada about resolution, but we suspect OnePlus will put a 1080p panel at the front of the OnePlus 5.Truth be told, a 5.5-inch display with such size and resolution works out an acceptable sharpness of 401ppi. In this day and age, Quad HD displays are getting more and more common, but it seems like OnePlus is not ready to jump on that bandwagon just yet. Judging from past experience, the display will likely be of the AMOLED type, which ensures excellent contrast and lowered power consumption in certain situations. Now, what chipset will be in the heart of things? No second opinion about it - the phone will most definitely be powered by the Snapdragon 835 silicon, which is currently making the rounds in the Galaxy S8 and S8+. The Snapdragon 835 is significantly faster than either the Snapdragon 820/821 that made the rounds in the OnePlus 3 and 3T, respectively, but we wouldn't go out on a limb and claim that users will be able to notice a groundbreaking difference in regular everyday usage. The two top-tier OnePlus devices are snappy performers, not only due to the chipsets on deck but also thanks to the pretty lightweight, stock-like OxygenOS on board. It's been confirmed the OnePlus 5 will indeed arrive with a Snapdragon 835 on deck. 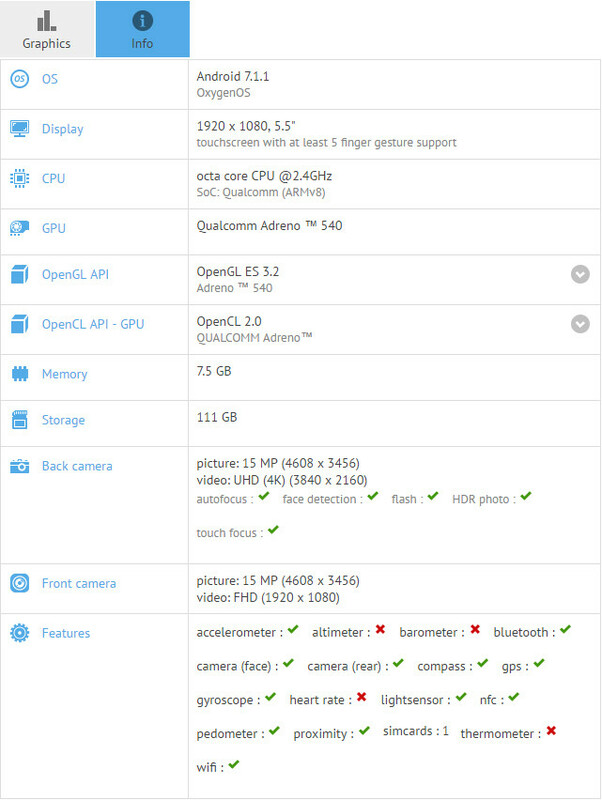 Recently, a hardware profile of the device leaked on benchmarking on the GFXBench, revealing the octa-core 2.4GHz, the Adreno 540 GPU, and most importantly, the amount of RAM the OnePlus 5 is getting - 8GB of the stuff, a notable update over the OnePlus 3/3T's 6GB. Multitasking overwhelming! As far as native storage goes, the OnePlus 3 and 3T were available in 64GB variants only and had no microSD card in sight. Rumor has it the OnePlus 5 will be also come with 64GB of storage in the base version, but this one will be joined by a 128-gog endeavor. Sounds great! However, no info about microSD card support is out there yet. Given that OnePlus' phones are dual-SIM devices, it seems like a logical thing to repurpose one of the SIM slots to double as a microSD card slot. UPDATE: According to some leaked benchmarks, the OnePlus 5 will reportedly boast a 3,600mAh battery at the rear, which would be the largest one ever put in a OnePlus device. If true, this one will likely let the phone endure for a day and a half of regular and even heavier usage. There's also faster Dash charging pegged for release alongside the next OnePlus — reportedly, it will be a whole lot of 25% faster than the current Dash charging solution. UPDATE #2: Another source is claiming a 3,300mAh battery will be making the cut in the OnePlus 5. As a reminder, the OnePlus 3T sports a 3,400mAh battery and the OnePlus 3 before it - a 3,000mAh one. OnePlus is reportedly readying itself to jump on the dual-camera bandwagon with its next flagship! There's a number of ways OnePlus can go as far as dual cameras go - for example, it might throw in a wide-angle or a telephoto snapper at the back, but the latest rumors suggest that it might also be pulling a "Huawei P9/P10" and utilizing a monochrome secondary camera. If our past experience with such setups is something to go by, this one will most probably end up being more sensitive to light and will capture greater detail than your regular RGB camera. The images the B&W snapper produces will likely get intelligently combined with the color ones from the regular RGB shooter next to it with the end result being a sharper photo. One of the rear cameras is projected to be a 23MP shooter, whereas the front one is rumored to be a 16MP snapper, just like the one on the OnePlus 3T. UPDATE: A bunch of camera samples taken with the OnePlus 5 have come forth, with a few of these shares by none other than OnePlus' own CEO, Carl Pei. Check them out below. Global release by the end of June? As we mentioned in the preface, OnePlus doesn't exactly have a fixed annual time window for announcing, and subsequently, releasing its flagship devices. That said, it's been officially confirmed straight from the horse's mouth that the handset is getting unveiled on June 20 at 12 PM EDT. The launch will coincide with a bunch of pop-up events across lots of cities - New York, London, Paris, Berlin, Copenhagen, and others. The OnePlus 5 is likely to hit the shelves as early as June 22, though so far we only know of one location that's getting the phone at said date - India. The handset will be available exclusively from Amazon India. We suppose that the phone should become available for pre-order either on June 22 or a couple of days later down the line in the worst case scenario. As far as price goes, OnePlus has been slowly drifting away from the ultra-affordable price niche it occupied once. True, its phones are still way cheaper than many a high-end flagship, but the era of aggressively lowering the pricing is essentially over. Talk on the street is OnePlus will price the OnePlus 5 below $500, which many will regard a bargain price. Remains to be seen if the price will be comfortably set below the 500-dollar mark or the price tag will read $499. I think calling iPhone 7 plus' ability to switch between the dual camera lens a "lossless optical zoom" is arguably wrong. And I think that is a dual lens slapped on top of a one plus 3/T on there (thumbnail). It is wrong. Not arguablely. Optical zoom is one lens that zooms. Period. I haven't bought any OnePlus phones yet although I love trying new Chinese phones - have owned Huawei, Meizu, Zuk and Xiaomi phones so far. My main objection to OnePlus phones is their mediocre battery life - according to GSMArena's battery life tests, where they come out rather poorly. If you have only been used to a day or so battery life, you probably are happy with your OnePlus but I have been spoiled by other Chinese phones that give me a full 2 days between charges, can't accept less now. And nexuses are supposed to have a great battery life? That's one point where a nexus fails. I've had two Huawei phones. Mate2, and now the Mate8. The two gave me 3 days, the 8 gives me a little over 2. Works for me. Most of the these phones which on paper have big battery capacities have pretty mediocre to bad battery life. Very poor optimisation. Best battery life crown has to go to the Lenovo P2. OnePlus Logic!! keep increasing RAM(most of the users don't bother about) but keep the display at 1080p which is most used part of the phone. Ideally the flash should be above the lense, so that cast shadows are lower than the subjects. If the flash is below the lense, you'd have to hold the phone upside down. If the flash is between the two lenses, that is the worse design. THIN = battery won't last a day, without resorting to dimming the display, using battery savers, and not using your phone as you want to. Get into the phablet territory plz. It's what people want.